It was 1942, and I was four years old when my parents moved about six miles to a different farm home. There had been a storm that blew down our barn and killed some cows, and my mother had found a rattlesnake in the kitchen of our farmhouse. My dad, Amos, purchased a different farm west of Edmore near Six Lakes. He tied all of our cattle together and led them right down M-46 to our new farm. My mother, Nellie, drove a team of horses pulling a steel-wheel wagon that was carrying my sister, two brothers and me. Three more sisters would be added to the family at the new farm. I do not believe that move would be possible today with all of the hundreds of different vehicles that now travel that same highway. It was so exciting to explore our new home, but the thing that I most remember is that it had electric lights. That was a new experience for us. There was a single lightbulb in the middle of the ceiling with a pull string, and we pulled the string turning the light on and off until the bulb broke. 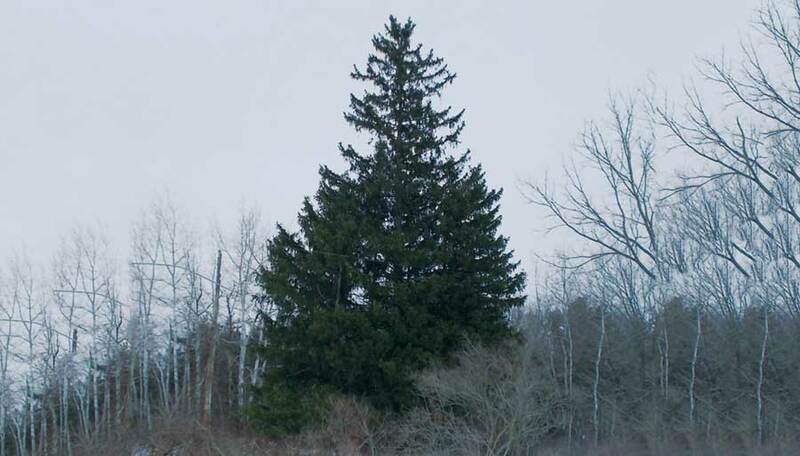 The yard had a tall pine tree that stood in front of the house, and we would climb it. Since that time the barn and the house have both burned, but the huge, 100-year-old pine tree is still proudly standing and can be seen for a mile. I served in the U.S. Navy and then returned to Six Lakes and now live in view of my old farm home and that beautiful, old pine tree.